Thankful for the push from my mom and dad. 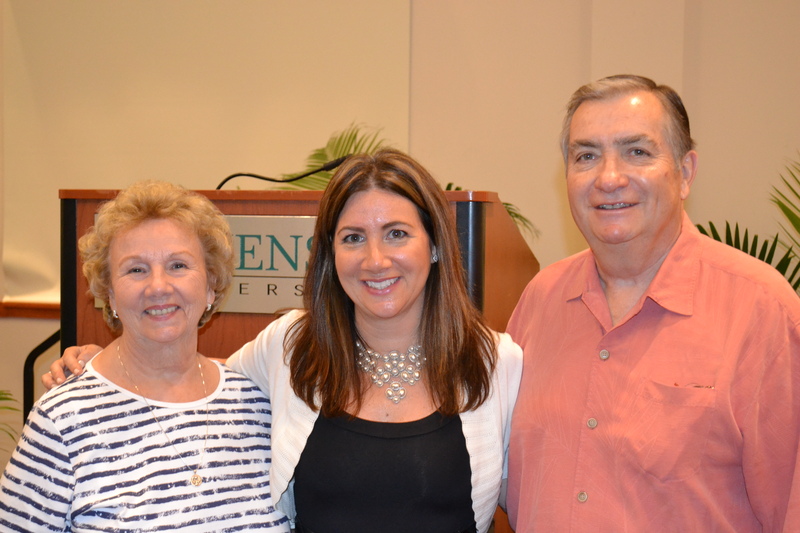 Here we are at my recent book talk on Stevenson’s campus. Looking back on my life thus far, I’m lucky: I’ve had it pretty good. You will hear very few complaints from me about the path my professional life has taken. As I spoke the other night to the graduating class at Baccalaureate, it was somewhat ironic that I was standing there giving a speech at all. While I’m a professor and have worked hard to be one, it wasn’t always the case. The fact of the matter is I didn’t really want to go to college. My boyfriend at the time wasn’t planning on going to college, though he did end up taking some courses at the community college, and this played a large part in my lack of a desire to go as well. I fought with my parents about it, but they persuaded me to give it a try and see how I liked it. If I didn’t like it, my dad said, I could come back to them and tell them what I did want to do with my life. I ended up going to Towson University and decided to live on campus. I’ll admit, after touring the school, I did get a little excited. And so, in the fall, despite wanting to stay home and be near my then-boyfriend, I made my way to Towson, where the first person I met was a blonde-haired, personable girl named Stacey from Amityville, Long Island, who was my roommate and is still my friend. It took about 24-hours for me to realize I was glad I had decided to try college. Twist of Fate #1. Despite the fact that academically my first year was rather bumpy—not for lack of brains, but rather for lack of seriousness and commitment to coursework—I enjoyed school. My father used to joke that I majored in “Partying.” I’m kind of social (okay, I know…I’m very social), and so this sort of got in the way, and I made the mistake of earning a couple of bad grades. When my father saw the grades he said, “These grades are crap. If you don’t get them up, you’ll be out of school so fast it will make your head spin.” He was so calm and so disappointed and that was the end of that. The next year, I heard people in the mass communication major talking about internships. I was walking through the University Union and came upon the internship board. I saw the index card: “Public Relations Assistants Needed: Baltimore Orioles.” To this day, I can’t tell you what possessed me to write down the address and send off a resume to the club, except that the buzz about internships prompted me to go back to my dorm, break out my electric typewriter with green ink, and draft a resume and cover letter (God only knows what the heck I put in it), and walk it to the mailbox. Within three weeks of mailing off that letter, I had been hired by my dear friend Julie Wagner at the Orioles in public relations. Twist of Fate #2. What happened as a result of that job in pubic relations was astonishing. My grades improved (and I became obsessed with getting good grades); I loved the courses in my major; I learned to budget my time and balance my school work and my demanding job. My parents, who up to that point shouldn’t have trusted me as they did, were kind enough to allow me to have my car on campus. I turned it around. Good student/good employee/good daughter. After I earned my bachelor’s degree, I decided to go back to school immediately to earn a master’s degree in Professional Writing. Twist of Fate #3. Fast forward years later: I was the director of publishing at the Orioles. My neighbor across the hall from me in my condo asked if I could teach a course at Anne Arundel Community College in public speaking. I told her my minor was in speech communication. I was hired by AACC, and taught my first course. Twist of Fate #4. Fast forward again: I worked for a total of 13 years at the Orioles, then worked one year at The Baltimore Sun in Communications as the Creative Services Manager. After that, I decide to teach and try my had at my own writing/design business. When I decided to leave The Sun, my friend, Blythe, who had worked at the Orioles, but who then worked for Ripken Baseball, called me and asked if I knew anyone who wanted to work part-time as a writer/designer. I asked her if she heard through the grapevine that I was thinking of leaving The Sun. She said she had no idea, but thought I might know a freelancer. I secured my first client, Ripken Baseball, thanks to Blythe, and began a two and a half year relationship with them as they were my best client. Twist of Fate #5. Since my Lucky Number is 7, I will end with this one: In 2008 as my daughter went to full day kindergarten, and I had shut down my business to raise two adorable kids, I was left twiddling my thumbs. A full-time faculty position became available at Villa Julie. I applied, and, well, the rest is history. Twist of Fate #7. The irony of this story? Sometimes your parents do know best. I am so thankful they pushed me to go to college even when I had doubts. I would never have given that speech the other night had it not have been for my parents. 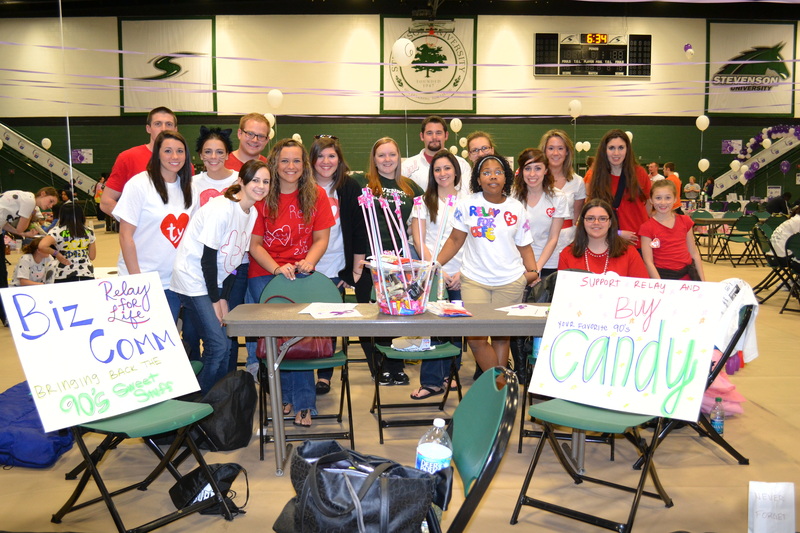 Business Communication majors at our Relay For Life event to raise money for the American Cancer Society. As I stood before the graduates pontificating on life’s wisdom, all I kept thinking was how proud I was of them. It’s so satisfying to know you’ve completed your degree. I had the same sense last year when I earned my MFA in Creative Writing. It was a challenge to earn it while teaching, raising a family, and trying to pay attention to my husband, family, and friends. It wasn’t easy, but it was rewarding. And I think that’s why giving that speech meant a lot to me–I had recently been through it again as I earned that MFA. I know and can relate to the students because I, too, had just been a student. As for those twists and turns of fate? Embrace them. And, if you can roll with them, you may encounter some pretty wonderful surprises. I know I have, and I’m forever thankful for them. You’ve been very fortunate. I’ve done a lot of interesting jobs over the years, but none with any great success. I often feel like I’ve missed my window, or that at my age I should be much further in life than I am. Timing…it all comes down to timing…and luck…and a little bit of smarts. You will see…maybe your book will be the big success of your life!